Abstract: Hygrothermal properties (such as thermal conductivity, sorption isotherm, moisture diffusivity etc.) are required for all Heat, Air and Moisture transfer (HAM) models. The objective of this work is to study the effect of different parameters of HAM model and simulation conditions on the prediction of temperature and relative humidity in a wall and a room made of hemp concrete which is known to have a low environmental impact. After presenting its physical properties, we present equations of the HAM model for a simple layer wall and for a building. Simulations are done with the environment SPARK suited to complex problems. Numerical model was validated by comparing the numerical results to experimental data available in the literature. This model is then used to analyze the sensitivities of HAM model parameters and modeling conditions on temperature and relative humidity profiles. Abstract: Increasing efficiency is an important issue in corporate management. Although many tools to measure efficiency have been developed, this paper proposed a new approach known as network-based Data Envelopment Analysis (DEA) as an even more effective tool for examining inter-firm relationships. More specifically, network-based DEA makes it possible to detect system-wide effects when marginal changes in related phenomena occur. This new approach was illustrated using data drawn from Mazda’s Yokokai keiretsu to reveal the impact that transactions among member firms in the network have on sales. Managerial implications in the formulation of corporate strategy are discussed. Study limitations are identified and directions for future research are proffered. Abstract: In large urban areas, where many activities occur due to a big number of citizens, physical polluting agents should be carefully assessed in order to protect human health. The monitoring and control of air pollution, acoustical noise, electromagnetic fields, etc., represent a relevant problem to be considered. Therefore, the development of mathematical models able to predict the air pollution behaviour is a very important field of research. In this paper, the authors will use a model based on Time Series (TS) analysis. A large set of field measurements is reconstructed by an appropriate functional form. The proposed model can evaluate the trend and the periodic pattern in the calibration dataset, and can forecast the slope in any future time range. The TS analysed in this work is composed by hourly CO concentrations observed in the urban site of San Nicolas de los Garza, Nuevo Leon, Mexico. To calibrate the model's parameters, a large set of one year field measurements will be analysed: this procedure will highlight a periodicity of 24 hours in the dataset and a substantial absence of any relevant trend. The authors will perform also a validation of the model on two different months, using data not adopted in the calibration phase. This procedure will show that the model is able to reproduce the overall trend and the periodic behaviour present in the large part of the dataset but, at the same time, it cannot predict isolated peaks or sudden fall of CO concentration. In addition, a Principal Component Analysis will be applied to a data set for one year period in order to investigate the relation among CO concentrations and other measured parameters (meteorological conditions and air criteria pollutants). Resulting principal components can be used in future multiple regression analysis in order to mitigate multicollinearity. Abstract: A dynamical model of quadrotor contains a number of non-linear internal and external influencing factors. Analysis of these factors influence is essential for the development of a qualitative flight control system. The impact of gyroscopic effect, centripetal acceleration and wind on the quadrotor motion are considered in this paper. Wherein, the flight is controlled by the cascade PDD^2 controller. We assessed the degree of the considered factors influence on the changing of the quadrotor state variables by modeling. Abstract: This paper covered basic investigation of the diffraction and scattered problem of a plane monochromatic wave on pre-fractal grating consist on finite number of the infinite thin perfectly electrically conducting (PEC) strips. Mathematical model of this task is singular integral equation (SIE) with supplementary conditions. Discrete mathematical model based on SIE using specific quadrature formulas of interpolation type with the equidistant grid of the polynomial of order (n-1) for integrals with singular singularities and integrals of smooth functions. Primary strategic course of this work is to use an efficient discrete singularities method (DSM) for the numerical analysis of the diffraction transverse magnetic wave problem. Abstract: The term predictive control designates a class of control methods which are suitable for control of various kinds of systems. The predictive control can be divided into several parts which are a model, a predictor, a cost function and constraints. The optimization problem must be solved in every each sampling period and it depends on parameters of the cost function and constraints. Various kinds of algorithms may be used for solving this problem. This contribution is focused on an analysis of the parameters of the cost function and the constraints and its effects to the optimization problem. Abstract: The method of truncated eigenfunction expansions is used in the present paper to construct a semi-analytical solution for an eddy current problem containing a surface flaw. The flaw is represented by a cylindrical hole in the upper layer of a two-layer conducting medium. The axis of the cylindrical flaw coincides with the axis of an eddy current coil carrying alternating current. The obtained solution is semi-analytical since there are two steps in the solution procedure that require the use of numerical methods: (a) calculation of complex eigenvalues without apriori information on the location of the eigenvalues and (b) solution of a system of linear algebraic equations. Results of numerical calculations are presented. Abstract: Leather manufacturing processes generate considerable amount of both solid and liquid waste. Especially chromium shavings represent potentially hazardous waste the processing of which is desirable not only from the economic, but particularly from the environmental point of view. To achieve the required quality of the resulting products it is crucial to remove some of the chemicals used during the treatment. The most important compound from this aspect is magnesium oxide (MgO). The most perspective method so far – extraction with diluted sulfuric acid – does not lead to total removal of MgO from the chromium cake. The contribution deals with the modeling of MgO extraction from chromium cake obtained by the filtration after alkaline hydrolysis of chromium shavings. We have studied in detail the conditions that could affect this technological procedure. The mechanism of the MgO extraction was studied through potentiometric titration and the kinetics data of the reaction of MgO with sulfuric acid within the given range of pH were obtained. Based on the experimental data, a mathematical model was proposed describing the extraction of MgO from chromium cake. The model will be further used as a tool for optimization of the extraction process. Abstract: In this work, first part of this study, the high resolution numerical schemes of Lax and Wendroff, of Yee, Warming and Harten, of Yee, and of Harten and Osher are applied to the solution of the Euler and Navier-Stokes equations in two-dimensions. With the exception of the Lax and Wendroff and of the Yee schemes, which are symmetrical ones, all others are flux difference splitting algorithms. All schemes are second order accurate in space and first order accurate in time. The Euler and Navier-Stokes equations, written in a conservative and integral form, are solved, according to a finite volume and structured formulations. A spatially variable time step procedure is employed aiming to accelerate the convergence of the numerical schemes to the steady state condition. It has proved excellent gains in terms of convergence acceleration as reported by Maciel. The physical problems of the supersonic shock reflection at the wall and the supersonic flow along a compression corner are solved, in the inviscid case. For the viscous case, the supersonic flow along a compression corner is solved. In the inviscid case, an implicit formulation is employed to marching in time, whereas in the viscous case, a time splitting approach is used. The results have demonstrated that the Yee, Warming and Harten algorithm has presented the best solution in the inviscid shock reflection problem; the Harten and Osher algorithm, in its ENO version, and the Lax and Wendroff TVD algorithm, in its Van Leer variant, have yielded the best solutions in the inviscid compression corner problem; and the Lax and Wendroff TVD algorithm, in its Minmod1 variant, has presented the best solution in the viscous compression corner problem. Abstract: As is known, solving of some problems in the ecosystem, communications, computational biology, mechanics and etc. are reduced to the computation of symmetric integrals. In some cases, traditional methods are applied to the calculation of these integrals, not keeping the suitable results. Therefore appears a need to constructing special methods for the solving of symmetric integrals. Here for these aims are proposed to using of multistep methods with constant coefficients. It is obviously that the advantage of the proposed methods are shown and constructed here the specific available methods advantages for which are illustrated by the some model equations, as well as the results obtained here also have compares by the known. Abstract: This work aims at description of possible processes which lead to estimation of electromagnetic fields in near field based on source reconstruction. This is a specific kind of an inverse problem where the known measured values are the far field intensities of electric and magnetic fields. Application of this work can help in localization of hot spots in a black box containing some emitters and thus for example help designers to appropriately modify the design or to use an interference suppression. That can be a reason why this work may be also important in the field of electromagnetic compatibility. Abstract: A taxation policy is one of the main instruments which can affect a range of national economy sectors and can support territorial development by special provisions in tax laws. Latvian current tax policy mainly continues the policy that follows after the tax reform of 1995. In general, the goal the tax system was to ensure capital inflow and capital market activities with the aim to increase foreign direct investment and to promote the development of national economy. The paper describes a mathematical model which can assist decision-making of policy makers and investors. The purpose of this article is to study the model which, based on the methodology of comparative economics, can allow supporting corporate tax policy decisions. So the study results in providing recommendation on the model and drawing consequent conclusions. The research is based on a comparative analysis of tax systems and academic literature. Abstract: In this work, the fifth of this study, numerical simulations involving supersonic and hypersonic flows on an unstructured context are analyzed. The Steger and Warming, the Van Leer, the Liou and Steffen Jr., and the Radespiel and Kroll schemes are implemented on a finite volume formulation, using unstructured spatial discretization. The algorithms are implemented in their first order spatial accuracy. To the turbulent simulations, the Van Leer and the Radespiel and Kroll algorithms are implemented with the Rumsey et al. model. The air inlet problem to the hypersonic inviscid simulations, and the re-entry capsule problem to the hypersonic viscous simulations are studied. The results have demonstrated that the Van Leer algorithm yields the best results in terms of the prediction of the shock angle of the oblique shock waves in the air inlet problem and the best value of the stagnation pressure at the configuration nose in the re-entry capsule configuration. The spatially variable time step is the best choice to accelerate the convergence of the numerical schemes, as reported by Maciel. In terms of turbulent results, the Rumsey et al. model yields good results, proving the good capacity of this turbulence model in simulate hypersonic flows. This paper is the conclusion of Maciel’s works started in 2011 and treats mainly the influence of the turbulence model on the solution quality. Abstract: Time delay systems are an important category of dynamic systems. Systems with delays, latencies and after effects can be described by using anisochronic models. This paper introduces an original approach to parameter estimation of a linear anisochronic model with the fixed plain structure of the type which is applicable for the control design of processes conventionally described by a serial combination of a rational transfer function and a transportation delay. This anisochronic model contains delays in both input and state. The model is very universal and it can be used for modeling both oscillating and non-oscillating systems. It is described how to convert the conventional linear models of various orders into the linear anisochronic model containing only five parameters. It is also shown how to estimate the parameters of this linear anisochronic model from the step responses. The simple computational formulas for parameter estimation are derived and then used for these purposes. Some of the obtained results are generalized for more complex anisochronic models at the end of the paper. The applicability of the suggested methodology is presented by three examples in the Matlab/Simulink programming environment. Abstract: Physical polluting agents are a relevant problem in urban areas. The need for monitoring and prediction of their time evolution is very useful to assess the impact to human health and activities. Considering their effects on health, the most hazardous agents to be considered are air pollution, acoustical noise and electromagnetic fields. Regarding acoustical noise, the complexity of predicting its slope is strongly correlated to its intrinsic randomness, related to the great variability of the sources. Sometimes, in some special areas, the predominant sources are stationary or have a periodic behaviour. In these cases, a time series analysis approach can be adopted, considering that a general trend and a local periodicity can be highlighted and used to build a predictive model. In particular, in this paper, the model is built composing three parts: the trend, that is the long term behaviour, the seasonality, that is the periodic component, and the irregularity, that includes the random variations. Applying such a model to a traffic noise levels dataset, obtained from a site in the city of Messina, Italy, a multiple seasonality is evidenced, resulting in two seasonal coefficients introduction (low frequency and high frequency). The validation of the presented model will be performed on a 44 days dataset, not used in the calibration. Results will be encouraging and will show a very good prediction performances of the model, especially in terms of difference between observed and simulated values (error). The error distributions will be analyzed and discussed by means of statistical indexes, plots and tests. Abstract: The objective of this research is to study the existence of solutions of a fifth order model equation for steady capillary-gravity waves over a bump with the Bond number near 1/3. We proved that there exist solitary wave solutions of equation (1). Abstract: The paper is focused on a design and implementation of a 1DOF (one degree of freedom) multivariable controller. The controller was designed in both discrete and continuous-time versions. The control algorithm is based on polynomial theory and pole – placement. The controller integrates an on – line identification of an ARX model of a controlled system and a control synthesis on the basis of the identified parameters. The model parameters are recursively estimated using the recursive least squares method. Abstract: The present work deals with the aeroacoustic analysis of a three-dimensional pantograph model, through the employment of an innovative analytical approach and a 3D numerical modeling. Specifically, the proposed analytical approach, aimed to predict the noise emission, is based on a modified formulation of the Smith and Chow's formula. Namely, by considering the entire landing gear structure as a sum of cylindrical elements, each cylinder noise has been individually calculated by the formula, as a result, based on the superposition principle, the whole noise is obtained; considering that the pantograph can also be considered as a sum of cylindrical elements, this formula, initially developed for aircraft landing gears, has been optimized and calibrated for the purpose of the present study. Because of, the analytical formula does not take obviously into account several effects related to the noise generation mechanism, a 3D numerical aeroacoustic model of the pantograph was needed. Specifically, the theoretical background adopted is the Williams and Hawkings acoustic analogy, an evolution of the well-known Lighthill acoustic analogy. The latter consists in the substitution of the noise generating surface with a distribution of dipole punctual sound sources, whose intensity is proportional to the temporal variation of fluid dynamic quantities acting in that point. As a result, a more detailed characterization of the noise spectrum can be provided. The analytical and numerical results have been then compared in terms of sound pressure levels and a well spectral contents, to themselves and to available experimental data. Abstract: This work describes a numerical tool to perform thermochemical non-equilibrium simulations of reactive flow in three-dimensions. The Van Leer and Liou and Steffen Jr. schemes, in their first- and second-order versions, are implemented to accomplish the numerical simulations. The Euler and Navier-Stokes equations, on a finite volume context and employing structured and unstructured spatial discretizations, are applied to solve the “hot gas” hypersonic flow around a blunt body, in three-dimensions. The second-order version of the Van Leer and Liou and Steffen Jr. schemes are obtained from a “MUSCL” extrapolation procedure in a context of structured spatial discretization. In the unstructured context, only first-order solutions are obtained. The convergence process is accelerated to the steady state condition through a spatially variable time step procedure, which has proved effective gains in terms of computational acceleration. The reactive simulations involve a Mars atmosphere chemical model of nine species: N, O, N2, O2, NO, CO2, C, CO, and CN, based on the work of Kay and Netterfield. Fifty-three chemical reactions, involving dissociation and recombination, are simulated by the proposed model. The Arrhenius formula is employed to determine the reaction rates and the law of mass action is used to determine the source terms of each gas species equation. The results have indicated the Van Leer TVD scheme as presenting good solutions, both inviscid and viscous cases. Abstract: The purpose of the presented study is to verify applicability of Raman spectroscopy for the thermal degradation screening of edible oils and their identification. The statistical method Principal component analysis was performed for large spectral datasets evaluation as well as Partial least square regression. Raman spectroscopy as an effective tool for material identification offers benefits that are required for the process control of oils quality, both in terms of food technology and in terms of maintaining the nutritional value of edible oils. These are rapidity, independence on the number of chemicals, portability and possibility of automation of measurements – advantages over the conventional laboratory procedures. For the degradation process the most common types of oils used in the Czech Republic were used: sunflower, olive and canola oils. For the identification fourteen vegetable oils and oils from seeds and nuts were used. Mathematically processed spectral data indicate the worst effect of thermal load in terms of degradation process products formation and the loss of cis double bonds, i.e. the unsaturation for sunflower oils. Olive oils as the best and canola oil represent lesser risk due to a greater content of antioxidants. However, longer heat load leads to undesired decomposition and unsafe and unhealthy products generation even in these oils. Abstract: In this paper, we examine the performance of classical portfolio strategies in the BRIC's stock markets using a Markov approximation of the portfolio returns. In particular, we try to evaluate whether these markets can be a valid investment for non satiable and risk averse investors. First, we examine the main statistical characteristics of the returns in each market. Secondly, we provide a methodology to approximate the portfolios sample paths when the returns follow a Markov process. Finally, we examine the profitability of the classic investment strategies in each of the four BRICs markets individually and in all markets jointly, under the assumption the returns are approximated by a non parametric Markov chain. In particular, we compare the ex-post sample paths of the wealth obtained optimizing a mean-variance performance with and without assuming the Markovian hypothesis. Abstract: Environmental issues increasingly come to the forefront of interests of society, which begins to be aware the current way of using resources of our planet is no longer sustainable. Efforts are being made to use the least environmentally burdening technology which includes those that have solved complex utilization of wastes. Hydrolysis processes offer a reasonable solution for the processing of certain part of wastes produced by leather industry that is besides its useful function perceived as consumer of resources and pollutants producer. Authors of this paper present a mathematical model based on the total mass balance of technology and balance of individual components to optimize the hydrolysate yield. The attention is also paid to the modeling of temperature and determination the time necessary for reaching the ideal temperature for running a hydrolysis process in a reactor. A significant aspect of new technologies is also the economic side. Therefore the mathematical models are associated with the purpose of minimizing of operating costs. Presented technology of tannery waste processing offers safe and environmentally friendly alternative to common ways of waste disposal as landfilling or incineration are, bringing the risk of leakage of hazardous substances into the soil and groundwater or the air. Abstract: This paper focuses on a semi-active suspension control applied to the secondary vertical suspension system of railway vehicle. The dynamics of nine degrees-of-freedom (9-DOF) railway vehicle model are governed which includes a vehicle body, two bogies and four wheel-set. The disturbance considered is track irregularity which is modeled as a sine wave. The control algorithm for the semi-active suspension system is developed based on PID controller and Stability Augmentation System (SAS) which is consists of inner and outer loops controller to reduce the effect of track disturbance and stabilize the pitch and roll response. The performances of passive and semi-active suspension are compared by simulation using MATLAB-SIMULINK software. The results of the study show that the PID and SAS controllers are able to significantly improve the ride quality of railway vehicle body. It can be noted that the an inner loop control (ride control loop) is able to further improve the performance of SAS controller for the system. Abstract: In this paper we study the elliptic curve Ea,b and Eai-b over ring Fp[i], where i2 = -1. 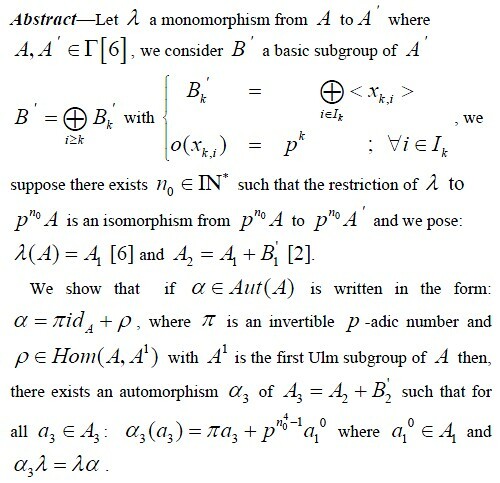 More precisely we will establish a isomorphism between Ea,b and Eai-b. After we define an internal composition law on the set E = Ea,b U Eai-b and we proof that Card(E) = 2Card(Ea,b). At the end we give an example of cryptography. Abstract: Leather industry is a prominent producer of large amount of waste. Some of this waste, especially chrome-tanned waste, is classified as hazardous. Disposal of this waste in landfills is expensive and brings both health and environmental risks. However, this waste also represents interesting source of valuable raw materials and it is advantageous to search for possibilities of its processing. Two-step enzyme hydrolysis seems the most attractive processing technology so far; however, it is not completely zero-waste due to its by-product, so-called chromium sludge. Relatively high protein content in the sludge represents technological obstruction and limits its further treatment and applications. The paper focuses on deproteination (removal of proteins) of chromium cake through a combination of mathematical and experimental methods. Mathematical model has been proposed for desorption of the protein fraction into the washing bath for various soaking numbers and decantation washing. The reliability of the model to predict the course of the desorption process was evaluated by means of experimental desorption of the protein fraction into the washing solution. The results of mathematical modeling showed that appropriate choice of conditions can lead to practically total deproteination of chromium cake. The mathematical model also serves as a basis for optimization of the process. Abstract: This paper deals with a hybrid actuator composed by a piezo and a hydraulic part controlled using two cascade Lyapunov controllers for camless engine motor applications. The idea is to use the advantages of both, the high precision of the piezo and the force of the hydraulic part. In fact, piezoelectric actuators (PEAs) are commonly used for precision positionings, despite PEAs present nonlinearities, such as hysteresis, saturations, and creep. Problems such nonlinearities must be taken into account in the control. In this paper the Preisach dynamic model with the above mentioned nonlinearities is considered together with cascade controllers which are Lyapunov based. The sampled control laws are derived using the well-known Backward Euler method. An analysis of the Backward and Forward Euler method is also presented. In particular, the hysteresis effect is considered and a model with a switching function is used also for the controller design. Simulations and real measurements are shown. Abstract: In many real-world optimization problems, a wide range of uncertainties have to be taken into account. Therefore, real-world optimization problems can be regarded as uncertain optimization problems. In uncertain optimization problems, objective function values observed are corrupted by noise. A number of evolutionary algorithms reported to solve uncertain optimization problems use the average of randomly sampled values as an estimate of the true objective function value. In this paper, a predicted upper bound of the noisy objective function’s values is used to evaluate the quality of solutions of uncertain optimization problems. This is because we should prepare for the worst possible pass in real-world optimization problems. In accordance with the new criterion of solutions, uncertain optimization problems are formulated as worst-case value minimization problems in which the predicted upper bound of the noisy objective function’s values is minimized. An extended variant of a recently-developed evolutionary algorithm, namely Differential Evolution (DE), is also proposed to solve the worst-case value minimization problems effectively. In order to allocate the computing budget to promising solutions, the extended DE adopts two pruning techniques, namely prediction interval and cutoff point, which can judge and discard hopeless solutions only by a single sampling. Abstract: Considering the Euclidean Jordan algebra of the real symmetric matrices endowed with the Jordan product and the inner product given by the usual trace of matrices, we construct an alternating Schur series with an element of the Jordan frame associated to the adjacency matrix of a strongly regular graph. From this series we establish necessary conditions for the existence of strongly regular graphs. Abstract: In this paper the diffuse interface model for direct numerical simulation of liquid-vapor interfaces in the presence of surface in presented. This model is developed from two-phase compressible flow approaches known as relaxation-projection method for compressible flows, simple and efficient relaxation method using pressure non-equilibrium model. The model accounts for the phase compressibility and surface tension effects and adapted for simulation of the bubble and drop flows. Results of testing of numerical technique are presented and demonstrate the good perspective of developed approach for simulation of multi-phase flows. Abstract: We study the BMO and the L^p solvability of the Dirichlet problem for a second order divergence form elliptic operator with bounded measurable coefficients in a Lipschitz domain. We obtain a relation between the BMO-constant of the operator (see Definition 6) and the solvability exponents p.
Abstract: Atmospheric pollution can be harmful to people’s health, especially in urban areas and close to chemical industries. In order to prevent and minimize the environmental impacts from these industries, it is convenient to use computational systems that simulate scenarios related to pollutant dispersion. In this work, a new analytical method is proposed to solve the correspondent mathematical model. The method uses two first order differential restrictions, which produce auto-Bäcklund transformations to the steady two dimensional advection diffusion equation. The main feature of this formulation is that the processing time to obtain the analytical solutions is significantly reduced. Abstract: Criterias for the selection of the multimedia applications for learning are based on Bloom’s digital taxonomy. Since there are more then one criteria for the selection of multimedia application for learning, multiple criteria decision making (MCDM) methods are needed to be used. In this paper FAHP and TOPSIS methods are proposed to be integrated for the selection of the best multimedia application for learning and teaching. First the FAHP method is used for determining the weights of each criteria and priority values of multimedia applications. Triangular fuzzy numbers are used in FAHP method for determining the benefits of one criteria to another. Then the TOPSIS method is used to determine the final ranking of the multimedia applications. The best multimedia application for teaching and learning would be the one that is farthest from the negative ideal solution and nearest to the positive ideal solution. The integration of FAHP and TOPSIS methods enables teacher to efficiently select a more suitable multimedia applications for learning. Abstract: For many years now the development of models capable of predicting company bankruptcy has aimed at increasing their accuracy. Among the decisive factors determining the accuracy of the bankruptcy model have been the choice of variable models and applied classification algorithms. The prevailing opinion in literature is that the accuracy of bankruptcy models cannot be appreciably improved by the choice of classification algorithm. A reflection of this assertion is the frequent usage of parametric methods. In particular this involves the method of linear discrimination analysis. This method formed the basis of the first bankruptcy model and continues to be the most frequently applied classification algorithm. However, it requires the fulfilment of assumptions which financial data does not provide and therefore limits the improvement of the model’s predictive capabilities. This led the authors to the idea of testing the possibility of improving the bankruptcy model’s predictive capabilities by using non-traditional approaches. Using the example of companies from the Czech Republic it was discovered that a nonparametric method, when used for the selection of model variables as well as the actual classification, can yield significantly better results than the traditional parametric approach. Abstract: In this paper we investigate a reduced Cosserat continuum. This model was suggested as possible model to describe granular materials. Here we get thermodynamic equations for the current and reference configuration. Abstract: The purpose of the presented research is to improve color conversions of images that are losing important visual information when color reductions are applied. This in a very common problem in grayscale printing operations of color images when textual information and background have the same grayscale luminance value. Thus, taking into account the perceived neighboring color differences, the proposed algorithm adjusts iteratively the pixel values so that information that is usually lost in a standard color contraction becomes visible. Abstract: The main purpose of the paper is to present one approach of completion of a given lattice to lattice with some properties of Boolean lattices and its applications to concept lattices. We provide some proofs, examples and their applications. Also we construct a minimal P- completion of one concept lattice, that naturally arised in a study of the suppressors of plant viruses. Abstract: Well-known and important problem of portfolio selection (optimization) in economics, finance and management was partially solved using traditional methods and techniques. However, since the problem is intractable, nondeterministic optimization metaheuristics are better suited tools for such problems. This paper presents artificial bee colony (ABC) swarm intelligence metaheuristic for solving constrained portfolio optimization problem. To prove the algorithm’s robustness and efficiency for this application, series of tests on standard benchmark portfolio data used in the literature were performed. The algorithm was compared to the genetic algorithm (GA) approach and firefly algorithm (FA) swarm intelligence metaheuristic, which were tested on the same data set. Optimization results showed that the ABC algorithm obtains satisfying results. Abstract: This paper outlines the issues of Linear Matrix Inequalities (LMIs) and semidefinite programming with emphasis on their wide application potential in the field of automatic control. It presents the history and basic theory of LMIs, briefly introduces their possible solution by means of convex optimization, and overviews the selected problems from the control theory viewpoint. The final part of the work deals with the most popular LMI software solvers. Abstract: Because of the property of data fragmentation in decision trees that makes them more dependent on available data sets, random forests were invented to cope with the data fragmentation. Random forests generates their own decision trees with two parameters, the number of attributes that can be the candidates of split in each subtree and the number of trees in the forests. There are known recommended default parameters. But, the default parameters may not work well always. This paper investigates what kind of property of data sets may not be good for the default parameters, especially the first parameter of the number of attributes that can be the candidates of the split, and propose a guide line. Abstract: This paper analyses gravity and parabolic catenaries. It discusses development of an algorithm for tasks and optimising of the calculation. Different iteration methods have been used in order to optimise the calculation. The iteration methods are: direct iteration, regula falsi, bisection and Newton methods. Development of the algorithm is used in different tasks. For each method, attention is paid to suitability of application, needed time and number of calculation steps needed in order to achieve the correct result. Matlab was used for development of algorithms for tasks. Abstract: The paper describes some possibilities of control of technological process of anodic aluminium oxidation based on the experimental study and investigation of the influence of chemical composition of the used electrolytes on the thickness of the formed oxide layer. The influence of individual factors acting during the anodic oxide process has been investigated and based on the experimental results the prediction model was developed by the usage of neural networks, especially the cubic neural unit. The developed prediction model determines the layer thickness at surface current density 1 A∙dm^-2. The reliability of the developed model is 72.53% with predetermined tolerance range of ±2∙10^-3 mm. Abstract: The purpose of this paper is to offer a solution for building a controllable in refinement, adaptive contour, in a robust, intuitive manner, and generalized for any input point set. The presented algorithm is both mathematically elegant and general. Despite the fact that the problem and the solution are discussed for the two-dimensional case, the entire approach is valid for higher dimensions as well. Abstract: In the paper the problems of objects similarity measures and detection of similarity of objects are addressed. Currently, when using the object-based representation and object oriented approaches we frequently meet the problem of object similarity. This problem spans many different application domains in which it is necessary to apply decision making process. Given a pair of objects, it is of interest to know how they are related to each other. Similarity measures can be used in many types of data retrieval, data mining and many analysis tasks. Very often we can group the objects of a given application into clusters based on their similarity values. Sophisticated methods use multiple levels of objects in the frame of one task and different types of similarity: attribute, correlation or behaviour based similarity measures. Abstract: In this paper, we introduce the Stokes equations with a new boundary condition. 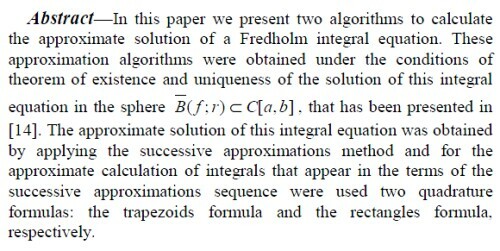 In this context, we show the existence and uniqueness of the solution of the weak formulation associated with the proposed problem. To solve this problem, we use the discretization by mixed finite element method. In addition, two types of a posteriori error indicator are introduced and are shown to give global error estimates that are equivalent to the true discretization error. Computational results suggest that both error estimators seem to be able to correctly indicate the structure of the error. Abstract: The effect of surface mass flux on a stagnation point flow over a permeable exponentially stretching/shrinking cylinder is studied. Using an exponential similarity transformation, the governing mathematical equations are transformed into nonlinear ordinary differential equations which are then solved numerically. Effects of uniform suction and injection on the flow field and heat transfer characteristics are thoroughly examined. Different from a stretching cylinder, it is found that the solutions for a shrinking cylinder are non-unique. The results indicate that suction delays the boundary layer separation, while injection accelerates it. The range of stretching/shrinking parameter where the similarity solution exists is larger for the exponentially stretching/shrinking cylinder case compared to the linearly stretching/shrinking cylinder case. Abstract: The main aim of this paper is to present a possible application of two-degree-of-freedom (2DOF) control design to systems with real parametric uncertainty. The control synthesis is based on algebraic tools and the robust stability analysis utilizes mainly the value set concept in combination with the zero exclusion condition. The set of illustrative simulation examples includes the control of first and third order controlled plants with interval parameters. Abstract: This article is devoted to the development of method of solution for multicriteria problems of decision-making in conditions of uncertainty. A model of fuzzy synthetic evaluation method is proposed. The method is realized by a neural network. Weights of the method and the network coincide. Abstract: The principal aim of this paper is to describe an elegant, efficient and simple to use approach to investigation of robust stability for discrete-time polynomials with various uncertainty structures. The key idea is based on generalization of the value set concept and the zero exclusion condition under robust Dstability framework. The set of examples for polynomials with single parameter uncertainty, interval polynomials, affine linear uncertainty structure and also more complicated uncertainty structures given in the paper provides not only the robust stability analyses but also the simple Matlab codes as an inspiration for practical implementation of performed tests. Abstract: An analysis is performed to study the non-Darcy fluid flow and heat transfer over a stretching sheet embedded in porous media with thermal radiation and ohmic dissipation. The sheet is considered to be permeable and the problem is nondimensionalized by using similarity transformation. The resulting problem is solved numerically by using shooting method for some values of the physical parameters. Numerical results for the velocity and temperature profiles are reported graphically for various values of physical parameters. The results indicate that suction enhances the heat transfer coefficient while injection causes a decrease in heat transfer. Abstract: This paper investigates the influence of the initial stress on reflection of plane waves at a perfect interface between an anisotropic thermo-piezoelectric medium and the vacuum in the context of Lord-Shulman theory. The equations of elastic waves, heat conduction equation, quasi-static electric field, and constitutive relationships for the thermo-piezoelectric medium are obtained.An analytical solution based on the wave theory is developed to obtain the reflection coefficients using the elastic and electric continuity conditions across the interface are satisfied simultaneously.The study shows that there exist independent wave modes satisfying the general Snell’s law and propagating along the interface for the incident wave angle, namely quasi longitudinal (QP) wave, quasi shear vertical (QSV) wave and quasi thermal (QT) wave. The expressions for the reflection coefficients of quasi plane waves are investigated where three relations between the reflection coefficients are obtained.A particular model is chosen for the numerical computations of reflection coefficients. Effects of anisotropy and thermal relaxation time, initial stress as well as parameters of electric potential are observed on reflection coefficients. This study is relevant to signal processing, sound systems, wireless communications, surface acoustic wave (SAW) devices and military defense equipment. Abstract: The Image Deblurring problem seems to be one of perpetual actuality. The research started in the Second World War for military purposes and continued until today proposing numerous techniques for a huge palette of applications, all aiming at recovering the original signal from a blurred one. The current paper synthesizes most of the efforts carried over the time, constructively comparing available approaches and offering a high degree of up-to-date completeness over this vast research subject. Abstract: As has been demonstrated by Beaver and subsequently Altman, financial indicators can pick up the risk of impending bankruptcy. This idea led to the construction of bankruptcy models that proved capable of identifying companies threatened with insolvency with great accuracy. A number of authors have demonstrated that the accuracy of bankruptcy models falls significantly if the given model is used in an environment other than that for which it was originally developed. The aim of this article is to identify the financial indicators that are statistically significant predictors of bankruptcy in various environments. The sample investigated is comprised of data on industrial concerns in the Visegrad Four countries for the years 2007 to 2012. A bankruptcy model based on the same set of variables was derived for each country by the method of Boosted Trees. The variables that are statistically significant in all countries and the variables that are specific for individual countries were identified by means of comparison of the significance of the variables in the models created (i.e. in different environments). Most important indicators of bankruptcy prediction can be described as indicators of company size, in our research the value of sales and total assets. Additional significant predictors are debt ratios, liquidity and profitability. However their significance for bankruptcy prediction is different, which is demonstrated by a high degree of variability of these indicators in the surveyed data sample. Abstract: This article is aimed at analyzing group performance based on common weights. The recommended methods in this area are just capable of comparing the groups under evaluation and are not capable of measuring group performance. To evaluate group performance, in addition to group efficiency, some other indicators are required as efficiency of each unit in the related group and the efficiency spread. In this way, none of the methods have considered all these cases for group efficiency analysis. In this study, a method is presented in order to analyze group performance using common weights method to be able to estimate all the mentioned indices. Moreover, the recommended approach will be compared with the current methods by an illustrative example. At the end, the method will be applied for the evaluation of group efficiency performance in banks. Abstract: It is known that the singularities of bounded invertible piecewise isometric dynamical systems in Euclidean plane can be classified as, removable, sliding and shuffling singularities, based upon their geometrical aspects. Moreover, it is known that the Devaney-chaos of the bounded invertible piecewise isometric systems can be generated only from the sliding singularities, while the other singularities remain innocuous. For this reason, we concentrate our efforts on the investigation of the sliding singularity. We begin with re-establishing the distinction between the sliding and shuffling singularities in simpler terms. And then, we calculate the sliding ratios explicitly for a class of invertible planar piecewise isometric systems. Abstract: This paper deals with a parameter set up of a PI- regulator to be applied in a system for permanent magnet three- phase synchronous motors to obtain a smooth tracking dynamics even though a chopper control structure is included in the drive. In particular, an anti-windup control structure is considered to avoid saturation and conditions on all controller parameters are found which guarantee stability. High performance application of permanent magnet synchronous motors (PMSM) is increasing. In particular, application in electrical vehicles is very much used. The technique uses a geometric decoupling procedure and a Lyapunov approach to perform a PWM control to be used as a chopper. Chopper control structures are very popular because they are very cheap and easy to be realised. Nevertheless, using a chopper control structure smooth tracking dynamics could be difficult to be obtained without increasing the switching frequency because of the discontinuity of the control signals. No smooth tracking dynamics lead to a not comfortable travel effect for the passengers of an electrical vehicle or, more in general, it could be difficult to generate an efficient motion planning if the tracking dynamics are not smooth. The paper presents a technique to minimise these undesired effects. The presented technique is generally applicable and could be used for other types of electrical motors, as well as for other dynamic systems with nonlinear model structures. Through simulations of a synchronous motor used in automotive applications, this paper verifies the effectiveness of the proposed method and discusses the limits of the results. Abstract: Amaranth an ancient crop plant rediscovered in food industry in recent years is characteristic for unique composition, exceptionally high content of quality protein. The content of substances essential for nutrition are even several time higher in comparison with other cereals. The current food processing technologies enable intentional separation of some substances or to increase their concentration to reach products with higher targeted effects. Authors of this paper present mathematical models of the enzymatic hydrolysis of amaranth grain, stem and flour. Enzymatic hydrolysis allows separation of quality amaranth protein as well as starch. Mathematical models are based on the transport phenomena in heterogeneous reaction system in the case of grain and stem and on heterogeneous reaction kinetics in the case of amaranth flour. The purpose is to nutritionally enrich amaranth material of valuable component included in crop and to obtain protein hydrolyzates for further applications in food industry, pharmaceutics or cosmetics. Abstract: There are several thermo-physical inverse problems discussed in the article, whose solution is based on non-stationery temperature field projection in the series. These series are obtained by means of separation of variables, which differs from a classic method of separation of variables and is especially convenient for solving various inverse thermo-physical problems. Abraham Temkin (1919 – 2007) was the first to apply this method for separation of variables. He has also created several methods for solving inverse problems. Those methods are not studied enough and are unknown to a wider circle of experts. Some of those methods are discussed in this article. Determination of heat transfer rule between a solid and its surroundings or environment is one of the inverse thermo-physical problems. Heat transfer rule can be determined much easier if average temperature of a solid and its rate of change are known. There is a way how average temperature of a solid can be found is described. When discussing inverse thermal conductivity problems, temperature measurements at the simplest possible temperature field mathematically in laboratory conditions are used as input data Therefore, a one-dimensional symmetric temperature field is described. One shows in the article that a point exists in such a temperature field that does not practically depend on time and where temperature is equal to average temperature of the solid. Abstract: A positivity preserving rational quarticBernstein-Bézierinterpolation scheme is developedfor scattered data. The constraints are developed on the Bézier ordinates to preserve the positive shape of scattered data. The weight functions are free to improve the shape of the surface. The developed scheme has more degrees of freedom as compared to existing rational positivity preserving interpolation schemes. It is local and equally applicable to data as well as data with derivatives. Abstract: This paper deals with simulation results of model of heat transfer through the wall with different parameters of wall. Next, presented model has been implemented into model of heating system using of outdoor temperature compensation, in which have been also included others models: model of heating body and model of equitherm curves based on the temperature levels. Finally, results of simulation of whole heating system based on the outdoor temperature compensation are shown. In detail, there are presented dynamics of heat transfer through the wall and there are described inverse Laplace transform of special functions, which occur in solving of partial differential equations system.